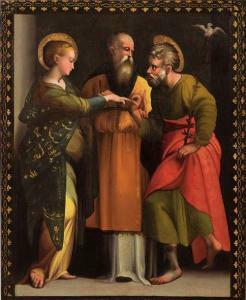 Such is Christian matrimony, modeled, according to the famous expression of St Paul, on the union of Christ with His Church. In the one as in the other, the gift of self is total, exclusive, irrevocable; in the one and in the other the husband is head of the wife, who is subject to him as to the Lord; in the one and in the other the mutual gift becomes a principle of expansion and a source of life (Ephesians 5). Thus, married couples, in the providential mission assigned to them, are properly the collaborators of God and of Christ; something divine pertains to their achievements, so that they may call themselves divinae cosortes naturae—partakers of the divine nature. Is it surprising that these splendid privileges should entail grave duties? The nobility of the divine action obliges married Christians to considerable self-denial and to the performance of many acts of courage, so that matter may not hinder the spirit in its ascent toward truth and virtue and with its weight drag it down toward the abyss. But as God never commands what is impossible and with the order which He gives grants als the strength to fulfill it, matrimony, which is a great Sacrament, brings, together with its duties that may appear superhuman, help that shows itself to be supernatural. A mutual affection springing solely from the inclination which draws man toward woman, or from mere pleasure in the human gifts which one discovers with such satisfaction in another; such an affection, however beautiful and deep it may prove to be, and however beautiful and deep may be its echo in the intimacy of the trusting conversations of the newly wed, would never be sufficient in itself. It could not even fully achieve the union of your souls in bringing you toward one another. Only supernatural charity, a bond of friendship between God and man, can tie knots strong enough to resist all the shocks, all the vicissitudes, all the inevitable trials of a long life spent together; only divine grace can make you rise superior to all the little daily miseries, all the nascent contrasts and disparities of tastes or of ideas, springing, like weeds, from the root of fallible human nature. And this charity and grace, is it not the strength and virtue which you went to ask of the great Sacrament you received? Divine charity, greater yet than faith and hope, is needed by the world, society and the family! Cordiality and tenderness, then, from one side and from the other. ‘Love and faithfulness,’ he used to say, ‘always create intimacy and confidence; thus the saints were wont to give many demonstrations of affection in their marriages, demonstrations truly amorous, but chaste, tender, but sincere’; and he used to cite the example of the great king, St Louis, no less stern toward himself than tender in his love for his wife, a man who knew how to bend his martial and brave spirit ‘to those little duties necessary for the conservation of conjugal love,’ to those ‘little attestations of pure and frank friendship,’ which do so much to bring hearts together and make married life happy. What more and better than true Christian charity, devoted, humble, patient, which conquers and subdues nature, which is forgetful of itself and solicitous at all moments for the well-being and happiness of others, will know how to suggest and direct those thoughtful little attentions, those delicate signs of affection, and maintain them at the same time spontaneous, sincere, discreet, so that they may never seem irritating, but may always be welcomed with pleasure and appreciation? What better than grace, which is the fount and soul of that charity, will be your master and guide to make you choose almost by instinct the right moment for such human and divine tenderness? However, you well understand that, if cordiality and tenderness have to be reciprocally exchanged by husband and wife and must adorn them both, they are nevertheless two flowers with a different beauty, springing as they do from a root somewhat different in man and woman. In man their root should be an uncompromising and inviolable faithfulness, which does not allow itself even the smallest deviation that would not be tolerated in his companion; as is fitting for him who is the head, it gives an open example of moral dignity and courageous frankness in never faltering from or shunning the full performance of his duty. In woman the root is wise, prudent, and watchful reserve, which removes and avoids even the shadow of anything that could soil the splendor of a spotless reputation or which could in any way endanger it. From these two roots also springs that mutual trust which is the olive branch of perpetual peace in married life and in the flourishing of its love, for is it not true that without trust love faints, grows cold, freezes, dies, ferments, disrupts, tears and kills hearts? Therefore, observed St Francis de Sales, ‘While I exhort you to grow always in that reciprocal love which you owe one another, take good care that it does not turn into a sort of jealousy; because it often happens that, as the worm is engendered in the most exquisite and ripest apple, so jealousy is born in the most ardent and devoted love, whose substance, however, it spoils and corrupts, provoking little by little disputes, dissensions, and divorces.’ No; jealousy, an exhalation and weakness of the heart, does not grow from a love that ripens and preserves the sap of true virtue, because ‘the perfection of friendship presupposes the certainty of that which is loved, while jealousy presupposes its uncertainty.’ Is not this the reason why jealousy, far from being a sign of the depth and true strength of a love, reveals instead its imperfect and base sides, which descend to suspicions that pierce innocent hearts and draw bitter tears? Is not jealousy, more often than not, perhaps a mitigated form of selfishness that alters the nature of affection; of selfishness bereft of that true gift, that self-forgetfulness, that faith unfraught with maligning thoughts, but trusting and benevolent, which, even here below, thus becomes the most profound and inexhaustible fount, no less than the safest guardian and preserver, of perfect love in a husband and wife. 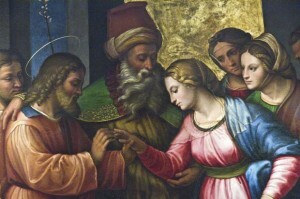 As an indissoluble contract, marriage has the power to constitute and bind the wedded pair in a social and religious state having legitimate and perpetual character, superior to all other contracts in this respect: that no power on earth—within the meaning and scope of Our previous declarations—is able to dissolve it. One of the parties would in vain attempt to free himself from it: the refuted contract, even if violated, disowned, torn up, does not loosen its grip; it continues to obligate with the same vigour as on the day when the consent of the contracting parties sealed it before God: not even the victim can be freed from the sacred tie which binds him or her to the one who has betrayed. That tie is not unknotted, or rather broken, except by death. All this notwithstanding, fidelity says something still stronger, still deeper, but at the same time more tender and infinitely sweet. For, as the marriage contract unites the wedded couple in a community of social and religious life, it has to determine the precise limits within which it binds them, to refer to the possibility of external authority to which one of the parties may resort to force the other party to fulfill the duties which have been freely accepted. But, while these juridical particulars, which are, as it were, the material body of the contract, necessarily give it, so to speak, a cold, formal aspect, fidelity is like the heart and soul of the contract, its open proof, its clear witness. Though it is more exacting, fidelity turns into sweetness the elements of rigour and austerity which juridical precision seemed to stamp on the contract. More exacting, yes; because fidelity considers faithless and a perjurer not only whoever makes an attempt through divorce—vain and ineffectual, anyhow—against the indissolubility of marriage, but also whoever makes an attempt through divorce—vain and ineffectual, anyhow—against the indissolubility of marriage, but also whoever, though not materially destroying the home he has founded and continuing the communion of conjugal life, yet takes the liberty of forming and maintaining another criminal relationship. 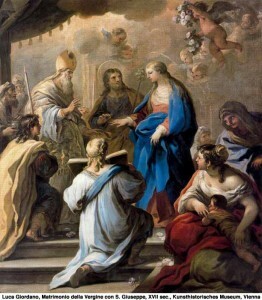 He also is deemed unfaithful and a perjurer who, though not maintaining an illicit relationship for any length of time, makes use, be it once only, for someone else’s pleasure or for his own selfish and sinful satisfaction, of a body to which—in the words of St Paul—only the legitimate husband or wife has a right. True Christian fidelity, still more exacting and particular than strict natural fidelity, dominates and goes farther; it rules and reigns, lovingly sovereign, over the whole expanse of the kingdom of love. Indeed, what is fidelity if not religious respect for the gift that each mate has made to the other, of self, body, mind, and heart for the full course of life, with no other reserve save the sacred rights of God? The freshness of youth in flower, modest elegance, the spontaneity and delicacy of her ways, the inner goodness of her soul, all these good and beautiful attractions which go to form the indefinable charm of a pure and innocent girl, have won the heart of a young man and have so drawn him toward her with the rapture of an ardent and chaste love that one would vainly look elsewhere in nature for an image which could express so delightful an enchantment. But the years, passing over handsomeness and beauty and the dreams of youth, take away some of love’s freshness and give it in exchange a more thoughtful and austere dignity. The growing family adds to the burden which weighs on the father’s shoulders. Maternity, with its cares, its sufferings, and its risks, calls for and exacts courage: the wife, in the field of honour of conjugal duty, must be no less heroic than her husband in the field of honour of civic duty, where he makes the gift of his life to his country. And if distance, absence, and forced separations, and other delicate circumstances, should intervene, obliging a husband and wife to live in continence, then the wedded couple, remembering that the body of each belongs to the other, will, without any hesitation, accept their duty, with all its claims and consequences, and will, with a generous heart and without weaknesses, maintain the stern discipline which virtue enjoins. And when, with the advent of old age, there comes a multiplication of ailments and infirmities, and of the humiliating and painful consequences of bodily decay, a host of afflictions which, without love’s strength and support, would make repugnant the body which had formerly been so attractive, the most tender cares will be lovingly lavished on that body. This is fidelity in the mutual gift of the bodies. In their first meetings, during the time of their engagement, everything seemed enchanting: each gave to the other, with sincerity as much as innocent illusion, a tribute of admiration that aroused indulgent smiles in those who witnessed it… The expansion of joy and love gave to the conversations of candour, a vivacity, and a liveliness which lent sparkle to the minds and added a pleasing glitter to the treasure of knowledge each happened to possess; a very small treasure sometimes, but one which everything contributed to show off to the best advantage. This is attraction, enthusiasm; but it is not yet fidelity. That season passes; failings are not slow in appearing, differences in character in coming forth and growing, and perhaps a limited intellect becomes more noticeable. The fireworks have died out, blind love opens its eyes, it suffers disillusion. Then, for true and faithful love, begins the struggle, and at the same time the challenge. No longer blind, it becomes perfectly aware of these failings but accepts them with affectionate patience, conscious as it is of its own defects. And with the growth of discernment, it now goes on to discover and appreciate, under the rough surface, the qualities of judgment, good sense, and solid piety, rich treasures which, though hidden, are sound. While eager to bring to light and make the best of these spiritual gifts and virtues, love is no less clever and watchful in shielding from the eyes of others any gaps and blanks in intelligence or knowledge, as well as any eccentricities or asperities of character… Love is ready to perceive what brings together and unites, and not what divides; ready to rectify an error or dissipate an illusion, with so much good grace as never to irritate or offend. Far from showing off its own superiority, it tactfully asks advice of the partner, letting it appear that if it has something to give, it is also happy to receive. It is in this way, evidently, that a spiritual union is established in the wedded couple, an intellectual and practical co-operation which makes them both rise toward the truth in which there is unity, toward the supreme truth, toward God. What else is this but fidelity in the mutual gift of their minds? In sanctity, through grace, the wedded pair are equally and immediately united with Christ. Present-day living conditions tend to engender and practically introduce widespread leveling in male and female activities, so that not infrequently a husband and wife come to find themselves in a situation which almost approaches equality. And yet, the Christian conception of marriage, which St Paul taught his disciples at Ephesus, like those of Corinth, could not be clearer and more explicit: ‘Women shall be subject to their husbands as to the Lord, because man is the master of woman as Christ is the head of the Church…. As the Church is subject to Christ, so are women subject to their husbands in everything. Men, love your wives as Christ loved the Church and gave Himself up for it…. Let each man love his wife as himself, and let the wife respect her husband. It is not necessary to have great knowledge and experience with regard to family life to know how frequent are the lamentable falls which overthrow and destroy a love that had originally been pure and sincere and, still less, to understand those weaknesses, fickle as passion but whose wounds leave a stinging scar deep down in two hearts, even after they have been forgiven and reparation has been made…. Consider, on the one hand, the husband who is not able to meet all the expenses of a life of luxury; and, on the other hand, the wife who, with her mind full of thoughts for her many children, and with limited economic means, cannot change her modest household, with a wave of a magic wand, into one of the castles described in fairytales; and then say whether it will not seem to this married couple, whose days are monotonous and uneventful, that those days are paltry as compared with the romantic fantasies of novels and films. Too bitter is the awakening for anyone who lives continually in a gilded daydream; too lively is the temptation to prolong and continue it in real life. How many tragedies of unfaithfulness have had no other origin than this! And if either of the partners, having remained faithful, weeps, uncomprehendingly, over the straying of the guilty one, still dear and loved, he or she is far from suspecting the personal share of responsibility in the slipping and final fall of the other. He or she does not know that conjugal love, as soon as it loses its healthy sereneness, its strong tenderness, its holy fecundity, and resembles selfish and profane love, is easily tempted to seek full enjoyment elsewhere. Nor is the husband less imprudent who, in order to please his wife or to satisfy his own vanity, encourages her to abandon herself to all the whims and the most audacious extravagances of fashion in her dress and manner of living. Thoughtless young women do not perhaps even imagine the dangers to which they expose themselves and others…. Virtue lies midway; as against excessive compliance, it is possible to fall into the opposite excess of too much austerity. This is undoubtedly a rare case, but without its examples. Exaggerated strictness, which would transform the home into a place of sadness, with neither gaiety nor light, with no wholesome and Godly relaxations, without a wide scope for action, might lead to the same disorders as a too easy hand. Who does not foresee that the more rigorous the constraint, the more violent may perhaps be the reaction? The victim of this tyranny—the man or the woman, maybe even the oppressor himself—will be tempted at some time or other to put an end to married life. But if the ruinous consequences of frivolity frequently help to open people’s eyes and lead them back to better counsels an more sobriety, the straying caused by an exasperating severity is, on the other hand, often ascribed to a lack of sufficient rigour, which leads to still greater harshness and provokes further harm. Far from these two extremes—excessive indulgence and excessive severity—let there reign among among you moderation, which simply means the virtuous sense of measure and of what is fitting. Let the husband wish to see, and enjoy seeing, his wife dressing and acting with becoming elegance according to his means and social standing, encouraging and cheering her occasionally by some thoughtful gift, by praise for her looks and charm. In turn, let the wife banish from her home all that is unfitting and offensive to the Christian eye and the sense of beauty, and likewise any severity that would wither the heart. Let both enjoy reading, maybe together, good, beautiful, useful books that can instruct them, broaden their knowledge of things and achievements and the horizons of their art or work, inform them of the course of events, and keep them firm and better indoctrinated in faith and in virtue. Let them freely, but moderately, indulge in healthy and decent amusements that bring relaxation and cheer the mind. Let each be happy to see the other excel in his or her professional or social activities, in making himself liked for his smiling pleasantness among their mutual friends; and let them never be envious of each other. And lastly, a great stumbling block to be avoided is jealousy, which can spring from indulgence or be caused by too much severity; a most dangerous stumbling block to faithfulness. That incomparable psychologist, St John Chrysostom, described it with masterly eloquence: ‘Everything that can be said of this evil can never can never sufficiently describe its gravity. Once a man begins to suspect the person he loves most in the world, the person he would gladly give his life for, in what may he then find comfort…? But if a husband is anxiously tossed by these evils, even when they have no foundation to or reason, the poor, wretched wife is still more gravely tormented. He who should be her comforter in all her sufferings and her prop, is cruel to her and shows her only hostility… a soul thus prejudiced and struck by this disease is ready to believe everything, to accept all accusations, without discerning the true from the false, and more inclined to listen to one who confirms his suspicions than one who would dissipate them…. Exits, entrances, words, glances, the smallest sighs, all is spied; the poor woman must bear everything in silence; chained, so to speak, to the conjugal bed, she cannot even allow herself a step, a word, or a sigh without having to give account thereof to the very servants.’ May not such a life become almost intolerable? And is there cause to wonder then if, when the light and support of true Christian virtue are lacking, an endeavor is made to break loose from that life and escape from it through the shipwreck of unfaithfulness?